Tartan tights for Burns Night | Is This Mutton? Burns Night falls on 25 January every year to mark the birthday of the Scottish poet Robert Burns. The main attraction of Burns Night is the Burns Supper. This traditionally involves participants wearing tartan, listening to bagpipes, singing Auld Lang Syne - also sung at New Year’s Eve – and reciting the great writer’s songs and poems. Many people in Scotland will enjoy a supper of "neeps and tatties," turnips and potatoes, and of course, haggis, a savoury pudding containing sheep’s heart, liver and lungs, which is minced with onion, oatmeal, suet, stock and a selection of spices. It's absolutely delicious. At my last place of work, Burns Night was commemorated every year with a bagpipe player in full regalia, in the cafeteria. I'm not Scottish but I'm sure our friends north of the border will not consider this post a cultural misappropriation. I've got a red tartan skirt (plaid, to our US friends) but I was very much enamored with these Pamela Mann Jackson tights in petrol plaid. What to wear with them? 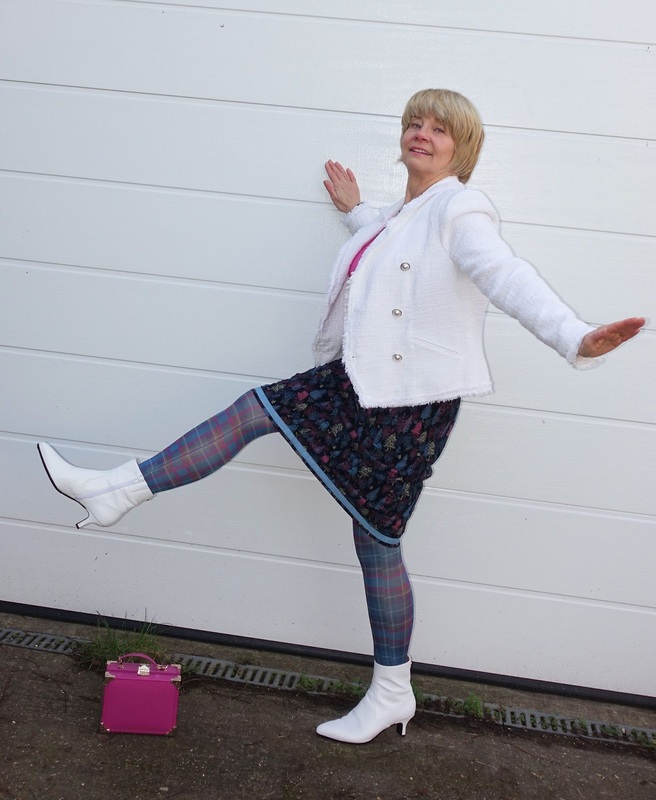 A heather and petrol blue toned skirt from Mistral (last seen here), a pink cashmere jumper, very old (and superb quality, in the way cashmere used to be), my pink Aspinal mini trunk bag and my latest crush, white ankle boots, with a white boucle jacket. It was a beautiful day, sunny with blue sky, even if it was a bit cold and my nose went red. Sharing this post with On Mondays we Link Up with Glass of Glam; Creative Mondays at Claire Justine, #ShoeandTell at Style Nudge; #IwillwearwhatIlike at Not Dressed as Lamb, Visible Monday at Not Dead Yet Style; Style with a Smile at Stylesplash; Turning Heads Tuesday at Elegantly Dressed and Stylish, #SpreadTheKindness at Shelbee on the Edge, Chic&Stylish at Mummabstylish, Top of the World Style at High Latitude Style, Fancy Friday at Nancy's Fashion Style. Fabulous Friday at A Pocketful of Polka Dots, #Weekend Wear at Threads for Thomas Thursday Moda.at Elegance and Mommyhood. 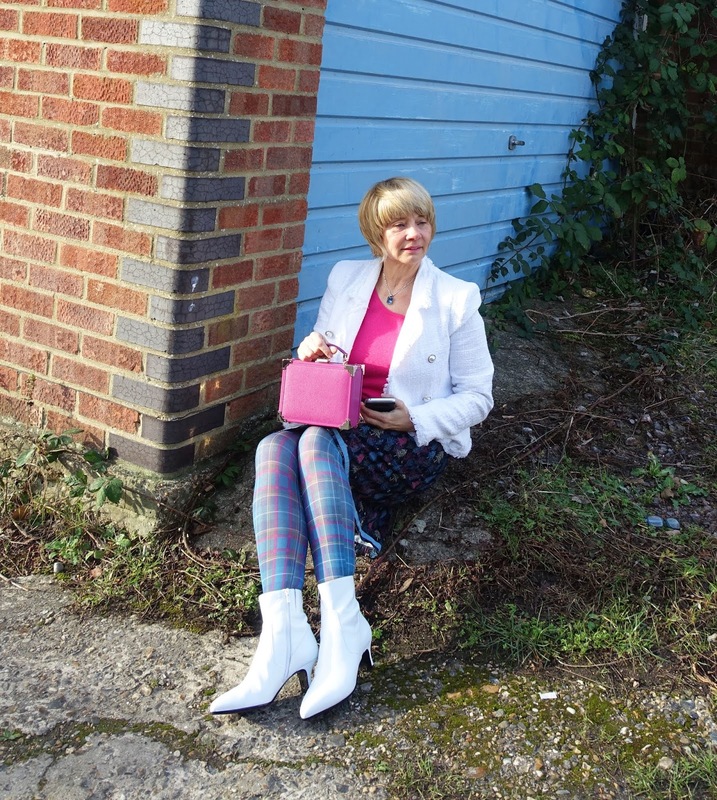 I'll be back on Wednesday with the #WowOnWednesday link up of fashion, jewellery and beauty posts. Great pattern combination with the skirt and tights! I love the white boots and jacket too! Thanks for linking up!